Josh Cobb hailed the ‘clinical’ Steelbacks after they cruised past Derbyshire Falcons by seven wickets at the County Ground on Sunday. Cobb smashed a superb 88 from 91 balls, while Ben Duckett made 70 from just 56 and Rob Keogh finished unbeaten on 63 from 61 as Northants easily passed the Falcons’ 272 for seven. It was a fine win for David Ripley’s men, who will now wait to see the results of Monday’s Royal London One-Day Cup matches. 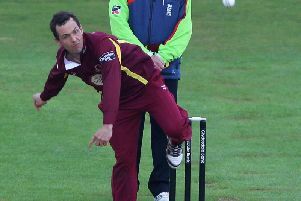 However, it is likely that the Steelbacks have already done enough to qualify for the quarter-finals of the competition, and they could even be playing their tie at home. Their run rate is good and with points in the bag, it is up to other sides to try to move above the second-placed side. Cobb was delighted with the way his team secured victory against Derbyshire and he saluted the convincing batting display, which saw the Steelbacks win with a massive eight overs to spare. “It’s a very good win and to finish with eight overs in hand is outstanding,” Cobb said. “A few of us were saying 240 might have been par but Richard Gleeson came back well with his four wickets to restrict them to probably just above par. “It’s was nice to be at the other end with Ben (Duckett) in that form and then Rob Keogh played really well, too.